Fried eggs, a popular breakfast dish in the United States, Canada, and Western Europe, take about 5 minutes to prepare. They are often served with toast or with other fried dishes. Melt the butter in the pan over low to medium heat. Crack open the eggs into the pan and let fry until the yolks begin to harden at the edges (indicated by a lightening in the yolk color). Using the spatula, flip the eggs over and allow to cook ten seconds for over-easy, thirty seconds for over-medium, or up to one minute for over-hard. It often considered a cardinal sin to allow the yolk of an egg to break (although some prefer fried eggs with broken yolks). If the cook ensures that the eggs are fresh the yolks will be more 'pert', and less liable to break. For Sunnyside Up, do not flip the eggs. Use a slightly lower heat, and cover the pan with a lid for some of the cooking period. 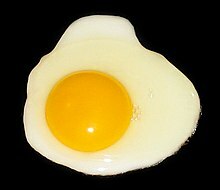 An ideal sunnyside up has a runny yolk, but the white should be cooked. Uncooked egg white (often called jelly) is normally unwanted and less-preferred than a partially cooked yolk, so err on the side of overcooking rather than undercooking the eggs. For a richer taste, try sprinkling with grated Parmesan or freshly chopped basil and chives. When frying eggs for sandwiches, rolls or wraps, it is often a good idea to break the yolks. This increases the coverage of yolk so that every bite gets some yolk, and prevents uncooked yolk dripping out. Heat 1/4 cup extra virgin olive oil over a low-medium heat (you will break the olive oil if you heat it too much). Crack open one egg into the pan and let fry while splashing some hot oil on the yolk so as to cook the top, if the egg begins to bubble, lower the heat. DO NOT FLIP THE EGG, it will cook with the hot oil you are splashing on it. Serve, add salt and pepper to taste. Ideally you will get a chunk of feta cheese, place next to eggs and pour the remaining hot oil on the cheese not only softening the cheese but basting and cooking at the same time, the smell is incredible and the taste is old world. Heat some bread and use it to soak up the oil... AMAZING! goes especially well with a piece of toast or two because the yolk is still pretty runny and very flavorsome! This recipe makes two sandwiches. The eggs are better over hard with the yolks broken so you don't get yolk dribbling down your arm while eating. Heat a medium pan over medium heat, fry 4 strips of bacon in one layer turning often until browned and crispy to your taste. Lower the heat if the bacon fat starts to spatter. Pour most of the fat into a teacup, leaving most of the brown bits in the pan. Wash the pan to remove the brown bits, dry the pan and put the pan back on the heat. Pour about a tablespoon of the bacon fat back into the pan. Crack open two eggs into the pan, add salt and pepper and fry for about 2 minutes, put the toast going and they will be done at about the same time. Break the yolks, spreading them over the whites, and flip the eggs. Fry for another minute. Assemble your sandwiches and eat. Now isn't that better than going to a fast food joint? Many people prefer their eggs only partially cooked. Please see Egg for possible health concerns of eating raw eggs. This page was last edited on 19 July 2014, at 11:47.